Perfect post to end 2010. See you next year! We saw you on the CB and wanted to stop by and wish you a very Happy and Healthy New Year. See you next year. Happy New Year. Purrfect end of the year post!! 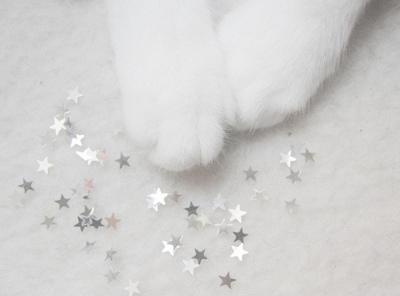 Love the paws and sparkly stars! Beautiful photo. thanks for following my blog. I'm not following yours too. Have a great New Year. love those sweet paws! HAPPY NEW YEARS! Lovely photo! Thanks for visiting my blog from the Saturday Pet Blogger blog hop. I'm following you back and I love your blog. What a pretty magical picture! I already feel 2011 is going to be a good year and that just adds to the good karma. Thanks for stopping by my blog for the Blog Hop. Enjoy the New Year! What a fantastic blog ! I saw your interview on Cody's blog, sensational ! Happy new year to you and all the cats of the blogosphere, and, of course, our so gentle typi..., euh, Humans !!! Hello! I am following the Caren Gittleman blog...She advised me to come here.